MoDOT, the Adventure Cycling Association, the Missouri Bicycle Federation, and many local partners have been working to have Bicycle Route 66 in Missouri officially adopted into the U.S. Bicycle Route System and outfitted with wayfinding signs across Missouri. We are hopeful to have the project completed and official recognition of the route from the national committee in time for BigBAM, Missouri's annual cross-state bicycle ride, to ride across Missouri Bicycle Route 66 in June 2018. Missouri and Kansas are working to designate sections of Route 66 as a U.S. bicycle route, and one of the states could receive approval for its route as early as this year. Ameren Missouri, which owns the 144-mile abandoned railway line, planned to donate the corridor and its right of way to the state, which would then create a second cross-state bike and pedestrian trail like the Katy Trail, built on the old Missouri-Kansas-Texas railway line, along the Missouri River. “The new trail will bolster Missouri’s position as the nation’s premier hiking and biking destination — and strengthen local economies all along its path,” Nixon, a Democrat, said at the time. But then politics, time and money intervened. The Ozark National Scenic Riverways Road and Trail Plan is currently being updated, and the National Park Service is accepting comments from the public to develop alternative management plans. Mountain biking is already authorized on many sections of the Ozark trail and surrounding areas that separate the region into two distinct trails systems. Providing access on a few key connections will turn these separate areas into a single, cohesive network. You can send a comment in support of mountain biking in Missouri's Ozarks in about one minute flat by using the People for Bikes online form. There is a zoning hearing on December 20 in St. Charles. After much feedback from trail supporters from across Missouri and the Midwest, in 2016 the Ozark National Scenic Riverway in east-central Missouri started work on a new trails and roads plan that may to allow mountain biking within park boundaries. Now they are asking for your opinion and public comment on three possible alternatives--through December 15th, 2017 January 15th, 2018. This is a big deal, as ONSR--which was the first national park area created to specifically protect a river system--is Missouri's only "real" national park. Created in the 1970s, ONSR has never allowed mountain biking. Now, because of numerous public comments in support during project scoping in 2015, ONSR has moved to created three Alternatives for trail and road use in the park. Join us on October 12, 2017, from 2-3 pm for a patriotic dedication ceremony and official trail opening. Winding along the serene James River valley, this portion of the greenway will be a contemplative place through which to honor our veterans who have served in all our nation’s military branches. This event is free and everyone is encouraged to attend! Ozark Greenways, The Missouri Veterans Commission, and the C.W. Titus Foundation are thrilled to present their collaboration to create a unique new trail section of the James River Greenway – the Trail of Honor. Residents and visitors will have the unprecedented opportunity to bike, walk, or run along the edge of the beautiful Missouri Veterans Cemetery. This trail was made possible by generous donors who designated gifts to the Trail of Honor during the 2016 Trails for Generations Funding Initiative. The League of American Bicyclists is asking people who support walking, bicycling, and local control of transportation funding dollars to contact their members of Congress this fall to show support for bicycling and walking. Jefferson City and Rolla have recently applied for Bicycle Friendly Community status, while Washington University in St. Louis has applied for Bicycle Friendly University status. Just the fact that these communities are applying for BFC status is a positive move for Missouri--we are starting to see far more interest in bicycling, walking, and trails from communities large and small, all across Missouri. Keep in mind that communities don't need to be perfectly bicycle friendly in order to apply and to be accepted. In fact, just the fact that these communities are appling for BFC and BFU status says a lot--it says that they are taking the time to assess what they have done and what they need to do to improve in the future, to become more bicycle friendly. Jefferson City has recently taken some very important steps--adopting a regional bicycle and pedestrian plan and installing quite a number of bicycle routes, signage, and bike lanes to complement the city's trail network. The Rails-to-Trails Conservancy is one of our partners in the effort to preserve the Rock Island RR corridor, and partnered with the Missouri Rock Island Trail, Inc, and MoBikeFed to organize last Friday's Rally in Support of the Rock Island Trail at the capitol. 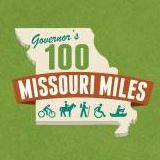 KCUR has coverage of Governor Greitens' work to decide whether or not to accept the next 144 miles of the Rock Island Trail State Park. Work to accept the trail has been going on over the past several years and the first 47 miles of the trail, from Pleasant Hill to Windsor, opened in December 2017. At the end of 2016, Governor Nixon announced that a 144-mile stretch of the former Rock Island rail line was on track for transfer to the State of Missouri by the end of 2017, to be developed into the Rock Island Trail. Now state officials under Governor Greitens are reconsidering whether to accept the planned donation of the rail corridor by Ameren. The Department of Natural Resources is asking for comments about the Rock Island Trail. We are asking all trail supporters to take a couple of minutes to complete the survey at the link below. Your input will help us let the Governor know there is strong support for the trail. Please share your support of the Rock Island Trail through this quick Department of Natural Resources survey.